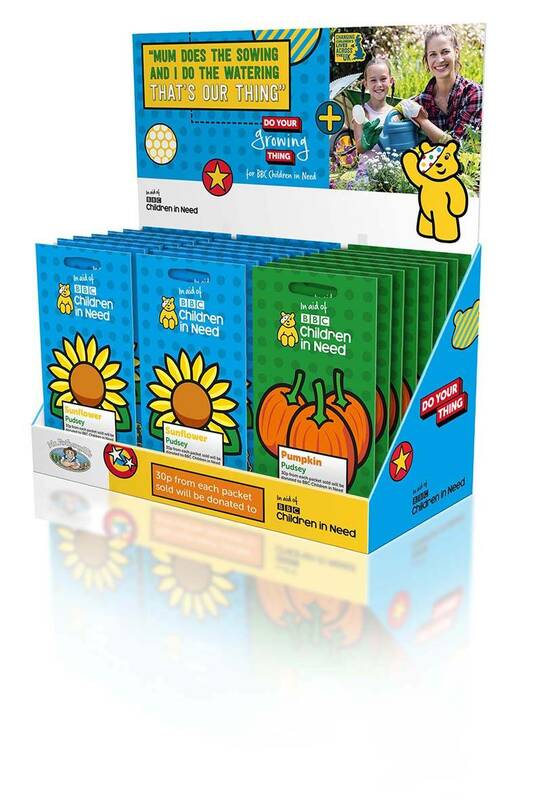 Mr Fothergill's is delighted to announce its NEW partnership with BBC Children in Need, to launch two seed packets for children- Sunfl ower Pudsey and Pumpkin Pudsey. For each packet sold, we donate 30p to BBC Children in Need, to help make a realdifference to the lives of children all across the UK. The bright and fun packets are available as a compact counter top display unit of 40 packets or as a hot spot stand of 150packets. Colourful and eye-catching POS is included on the displays, featuring the familiar Pudsey Bear character. BBC Children in Need believe that every child in the UK should have a childhood which is safe, happy and secure and allowsthem the chance to reach their potential. To help achieve their vision, they provide grants to projects in the UK which focus onchildren and young people who are disadvantaged. They currently support 2,400 of these projects. Since 1980, over £800 million has been raised in aid of BBC Children in Need.